Let consider a triangle with vertices at (x1, y1), (x2, y2), and (x3, y3). When the triangle is a right triangle, it would be pretty simple to calculate the area of the triangle by determining one-half the product of the base and height. Though, if the triangle is not a right triangle, then there are a couple of other ways by which the area can be found. When you know the lengths of three sides of a triangle, then we can use Heron's Formula to determine the area of triangle. In Heron's formula, s is the semi-perimeter (that is, one-half the perimeter of triangle). Let consider the triangle with vertices at (-2, 2), (1, 5) and (6, 1). By using the distance formulas, we can determine the lengths of the sides (randomly assigning a, b and c) are a = 3 sqrt(2), b = sqrt(61), and c = sqrt(73). Whenever we take the square root of that, you get 33/2, therefore the area of that triangle is 16.5.
a) Should know the lengths of the sides of triangle. When you don't then you have to utilize the distance formula to determine the lengths of the sides of triangle. b) You have to calculate the semi-perimeter; therefore chances are there to have fractions to work with. c) Lots of square roots are included. For the lengths of sides of triangle and for the area of triangle. d) It is not the simplest thing in the world to work with. The triangle can be surrounded in a rectangle. The vertices of triangle will intersect the rectangle in three places, making three right triangles. Such triangles are represented by A, B, and C in the figure. The area of triangle we want will be the area of the rectangle minus the areas of three triangles. The legs of three triangles can be found by simple subtraction of the coordinates and then employed to determine the area as the area of a triangle is one-half the base times height. 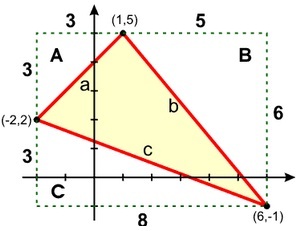 Area of triangle A = 3 (3)/2 = 9/2. 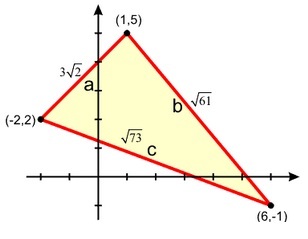 Area of triangle B = 5 (6)/2 = 15. Area of triangle C = 8 (3)/2 = 12. The sum of the areas of triangles is 9/2 + 15 + 12 = 63/2 or 31.5. Area of a rectangle is the base times height, therefore the bounding rectangle has area = 8 (6) = 48. The area of triangle in middle is the difference between the rectangle and sum of areas of the three outer triangles. Area of triangle = 48 - 31.5 = 16.5. 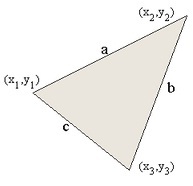 This turns out that the area of a triangle can as well be found by using the determinants. What you do is to form a 3×3 determinant where the first column is x's for all the points, the second column are y's for all the points, and the last column is all ones. = -2 (5 + 1) - 1 (2 + 1) + 6 (2 - 5) = -2 (6) - 1 (3) + 6 (-3) = -12 - 3 - 18 = -33. This is possible that you will get a negative determinant. Do not worry about that. The sign is recognized by the order you place the points in and can be simply modified just by switching two rows of determinant. Area, on the other hand, cannot be negative, therefore when you get a negative, simply drop the sign and make it positive. Lastly, divide it by 2 to determine the area. 33/2 = 16.5, that was the area. The plus or minus in this case is meant to take either sign is required therefore the answer is positive (that is, non-negative). Don’t say the area is both negative and positive. Why not use the absolute value, you ask? Well, think how confusing it would be to contain the absolute value of the determinant. Carry on with the idea of determining the area of a triangle. When the area of a triangle is equivalent to zero, then there would be no triangle and the points would be collinear on a line. We can use that information to build up a test for the collinear points. When the area of a triangle is zero, then the points are collinear. We can drop the plus or minus and one-half from the front of determinant, as the area will be zero only when the determinant is zero. Three points are collinear if and only if, the determinant found by putting the x-coordinates in the first column, y-coordinates in the second column, and one's in the third column is equivalent to zero. We are not setting the determinant equivalent to zero; we are testing to observe if the determinant is zero. Three points are collinear if and only if when the determinant is zero. We can force three points to be collinear by setting up the determinant equivalent to zero. Note this time, that the real variables x and y are in determinant. That is as you have two points on a line given and the point (x, y) is a generic point on line. Whenever you expand this, it is strongly recommended that you expand all along the first row. That way, our multiplications to determine the determinants won't include x or y. Suppose D is the determinant of the coefficient matrix. Suppose Dx be the determinant of coefficient matrix where the x column has been substituted by the constants from the right hand side. Suppose Dy be the determinant of coefficient matrix where the y column has been substituted by the constants from the right hand side. As long as D, the determinant of coefficient matrix, is not 0, then x = Dx/D and y = Dy/D. The Cramer's rule is named after Gabriel Cramer who lived from 1704 to 1752. He is not the one who developed the method originally, though, as the Chinese were known to have utilized the technique before him. Cramer's Rule can be extended to bigger systems in similar manner. Simply substitute each column in coefficient matrix by the right hand side, and then divide that determinant by the determinant of coefficient matrix. For a 3×3 system then suppose Dz be the determinant of the coefficient matrix where the z column has been substituted by the constants from the right hand side. a) Determinants can be found on the calculator for big systems. b) When we need just one variable, we can find it with Cramer's Rule, while with the other methods we would have to find all the variables. a) It takes a long time to re-enter each and every matrix to the calculator to determine the determinant. It is best suited for the computer or calculator program. b) It needs a square system. c) It doesn't always work. When the determinant of coefficient matrix is zero, the method fails and this is either no solution or many solutions. d) When D = 0 and Dx = 0 and Dy = 0 then there are many solutions. You won't be capable to tell what the solutions are from Cramer's Rule, however there are many solutions. This is dependent case. e) When D = 0, however at least one of other determinants is not zero, then there is no solution. This is inconsistent case. Cryptography includes encrypting data and hence a third party cannot intercept and read the data. In early days of satellite television, the video signals were not encrypted and anyone with a satellite dish could watch whatever was being displayed. Well, this did not work as all of the networks utilizing satellites didn't wish the satellite dish owners to be capable to receive their satellite feed for no cost whereas cable subscribers had to pay for channel, they were losing money. Therefore, they started encrypting the video signal with a system termed as Videocipher. What Videocipher encryption system did was to transform the signal to digital form, encrypt it, and send the data over to the satellite. When the satellite dish owner had a Videocipher box, and paid for channel, then the box would descramble (or unencrypted) the signal and return it to its original, helpful form. This was completed by using a key which was invertible. This was much important that they key be invertible, or there would be no way to return encrypted data to its original form. The similar thing can be done in using matrices. a) Transform the text of message to a stream of numerical values. b) Put the data into the matrix. c) Multiply the data by encoding the matrix. d) Transform the matrix to a stream of numerical values which comprises the encrypted message. Let consider the message ‘Red Rum’. The message is transformed into numeric form according to certain scheme. The simplest scheme is to let space = 0, A = 1, B = 2, ..., Y = 25 and Z = 26. For illustration, the message ‘Red Rum’ would become 18, 5, 4, 0, 18, 21 and 13. This data was put into matrix form. The size of matrix based on the size of encryption key. Let us state that our encryption matrix (that is, encoding matrix) is a 2x2 matrix. As it is seven pieces of data, it is place into a 4x2 matrix and fill the last spot with a space to make the matrix complete. Let us call the original, unencrypted data matrix A. There is an invertible matrix that is termed as the encryption matrix or the encoding matrix. We will call it matrix B. As this matrix requires being invertible, it should be square. This could really be anything; it is up to the person encrypting the matrix. We will use this matrix. The unencrypted data is then multiplied by encoding matrix. The outcome of this multiplication is the matrix having the encrypted data. We will call it matrix X. The message which you would pass on to the other person is the stream of numbers 67, -21, 16, -8, 51, 27, 52, -26.
a) Put the encrypted stream of numbers which symbolizes an encrypted message to a matrix. b) Multiply by decoding the matrix. The decoding matrix is inverse of encoding matrix. c) Transform the matrix to a stream of numbers. d) Transform the numbers to the text of original message. The message you require to decipher is in encrypted data stream 67, -21, 16, -8, 51, 27, 52, -26. Encryption matrix is never transmitted. It is recognized by the receiving party and hence they can decrypt the message. Other times, the inverse is recognized by the receiving party. The encryption matrix cannot be sent with data; or else anyone could grab the data and decode the information. As well, by not containing the decoding matrix, somebody intercepting the message does not know what size of matrix to utilize. The receiving end acquires the encrypted message and puts it into the matrix form. The receiver should compute the inverse of encryption matrix. This would be the decryption matrix or decoding matrix. The receiver then multiplies encrypted data by the inverse of encryption matrix. The outcome is the original unencrypted matrix. The receiver then takes the matrix and breaks it into values 18, 5, 4, 0, 18, 21, 13, 0 and transforms each of such into a character according to numbering scheme. 18 = R, 5 = E, 4 = D, 0 = space, 18 = R, 21 = U, 13 = M, 0 = space. Trailing the spaces will be removed and the message is received as intended: ‘RED RUM’.